I am not a local person. I was born in Gravesend, Kent and at the age of five with my parents we moved to Amersham in Buckinghamshire. I lived there for thirty odd years and then moved to Normanton in Yorkshire because of my husband’s job. I moved back to the south in 1978 after my marriage broke up. I couldn’t afford and didn’t want to move back to Amersham hence I came to live in Hemel Hempstead as I had friends here and in Berkhamsted. I didn’t like Hemel Hempstead at first (or for quite a while) but it has grown on me since. The flats where I live in Bohemia were built in the grounds of what had been the house and gardens of the actor James Hayter – in fact the lodge house still remains at the foot of the Nicky Line just off Queensway. Now into the “memory bit” – I remember Woolworth’s was twice the size that it is now, it sold food and had a wonderful delicatessen counter – I used to purchase all my cooked meats there and was very sorry when that all ceased and half the store was sold to an electrical company – I think – then Timothy Whites moved in. There were also at that time 14 shoe shops in the Marlowes with such names as Milwards, Bata, Dolcis and Farmers until all absorbed by the British Shoe Corporation and closures developed. I also remember the depressing looking building in Queensway that was St. Pauls Hospital for Maternity and the Elderly. Also the incredible day of people in wheelchairs and the “walking wounded” and a running fleet of ambulances and other vehicles as folk were transferred to West Herts Hospital because of the imminent closure of St. Pauls. 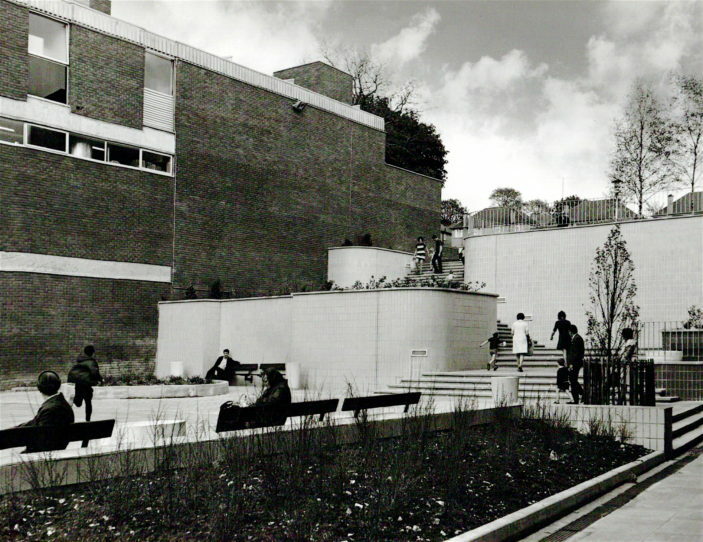 The circular car park now springs to mind that was in the vicinity of the original BP House, which was demolished because it was in danger of collapsing due to subsidence, and cracks in the mortar. Apparently Hemel Hempstead sits on a site of huge subterranean lakes. I was also pleased when the “dual carriageway” of the Marlowes was dispensed with to become a precincted area; I am a great believer in shopping centres being safe and free from traffic. If only the market was in this area I’m sure it would progress and be more popular – it used to be a very good market. Even the market traders would be happier if they were more central too! Before the new shopping centre was built – next to Boot’s the Chemist was an open area with steps up to King Harry Street and a furniture shop (possibly Times Furnishing) on the other corner with a small water feature and seats with a Wimpy Bar above. I think this place was called Times Square! There was also a glass sided bridge across the Marlowes. W.H.Smith was at the other end of the town where Blockbusters Video is now and on the other side of the road was the Wagon and Horses Pub. A very popular hostelry especially lunch times! Opposite Dacorum College was The Parade (now part of Marlowes) with a variety of little shops including a small supermarket, chemist and Midland Bank; it had much more character than all the businesses that dominate the area now. This page was added on 02/06/2012.